The Cave of a Hundred Hands site is located in the Fremont Indian State Park near Richmond, Utah. The cave contains 31 handprints as well as a variety of other pictographs. There is a trail that leads from the Visitor Center to the cave which is on the opposite side of Clear Creek and Interstate 70. Fremont Indian State Park is located about 21 miles west of Richfield, Utah on Interstate 70 and 18 miles east of the junction of I-15 and I-70. The trailhead for this hike can be found in the southeast corner of the parking area at the Visitor Center. Those that would like to park a little closer and cut about a half mile off of the round trip distance can drive east on the Clear Creek Canyon Road from the Visitor Center for about a tenth of a mile and park at the pullout there. The trail begins by dropping down a small hill and paralleling the Clear Creek Canyon Road. Within a few hundred yards the trail crosses the road and continues heading upstream between Clear Creek and the highway. After passing the other parking area along the Clear Creek Canyon Road the trail crosses a bridge over the creek. The 100 Hands Cave trail is sharing routes with the Centennial Trail and there are signs for both. As the trail continues it passes under Interstate 70. Once on the south side of the Interstate the route follows an easy path for the remainder of the distance to the cave. After arriving at the cave there is a kiosk that is helpful to read before climbing the small hill to view the rock art. The entrance of the cave is sealed with bars to help protect the site. Within the cave there are 31 handprints that were made using 3 different colors of paint. The kiosk has more information about the prints. 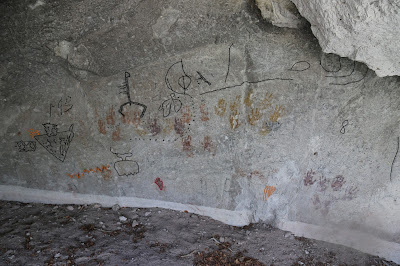 Besides the handprints there are a few other pictographs most of which were painted in black. We highlighted a few of them on the computer just to point them out but they are so faded that even on the computer we were only able to make a general outline of some of them. You can pick up a trail guide at the Visitor Center before starting out on the hike. They have laminated copies that you can borrow, or what we recommend is to print out your own copy from their website and bring it with you. Just like the 100 Hands Pictograph site in the Grand Staircase-Escalante National Monument the Cave of a Hundred Hands comes up short in palm counts. In this case it is 69 hands short. We are guessing that the names are more symbolic in nature and not meant to be taken literally. If you would like to see it for yourself then all you have to do is 'Take a hike'.